Head of the Chechen Republic Ramzan Kadyrov. "We will launch them into eternity and will give them a one-way ticket"
Ramzan Kadyrov, the leader of Chechnya in Russia's North Caucasus, has confirmed reports that the Russian citizen murdered by the Islamic State (ISIS) group was a native of Chechnya. "Yes, this Russian citizen was a Chechen. 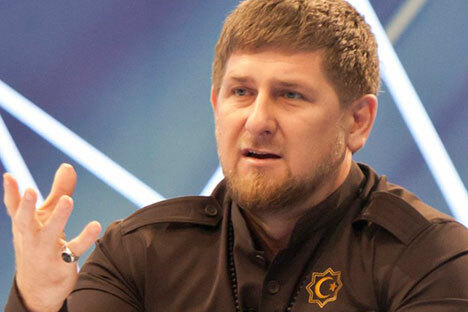 He was beheaded," Kadyrov told reporters on Dec. 3. There is no confirmation that this man was a member of ISIS and was working for them, he said. "I do not believe in this. He was sitting there with such an expression as though he had been set up. As if they had told him that they would now film him and then would let him go," Kadyrov said. "The Chechens remember, know this and will not leave it at that. Those who slaughtered our citizen and who threaten the security of our state will not live long. We will launch them into eternity and will give them a one-way ticket," the Chechen leader said. Meanwhile, a source within Russian special services told Interfax that "the victim is unlikely to have had any relation to our special services". If the militants had really uncovered a spy among themselves, "they would certainly have used him in some negotiating processes, which would have benefited the terrorists more than just his killing," he said. "The story offered by the terrorists looks even more doubtful considering the scope of a PR campaign run by ISIS," the source added. The U.S. television station NBC reported on Dec. 2 that ISIS militants posted an online video purporting to show the beheading of a man whom they accused of spying. The Israeli media network Arutz Sheva claimed that the man beheaded in the video was a 23-year-old native of the Republic of Chechnya in Russia's North Caucasus. It said that, prior to being beheaded, the captive admitted to having passed information about Russian citizens who joined ISIL from Syria and Iraq to Moscow.